Ruby port, walnuts and stilton – a classic combination which makes for a very special salad. The port and walnuts can also be done on their own – drizzle the port syrup over a wedge of Stilton and serve the walnuts on the side for a delicious addition to any cheese board. Combine the sugar, port and rosemary in a sauce pan and bring to a boil. Reduce the heat slightly and simmer for about 3-4 minutes or until the sugar is dissolved and the mixture is slightly thickened. Remove the rosemary and add the walnuts and stir to coat. With a slotted spoon remove the walnuts giving them a shake and transfer them to a parchment lined baking sheet – spread them out. Bake at 350 degrees for about 12 minutes or until they are somewhat dry – let them cool spread out on a plate, the sugar will harden and they will no longer be sticky. Heat a large sauté pan to medium high heat and add the oil and the tomatoes stir until soft, season with salt and pepper and continue until most of the liquid has evaporated. Set aside and wipe the pan clean. Bring the pan back up to medium high. Season both sides of the steaks with salt and pepper, add a drizzle of canola oil to the pan, and cook for about 4-5 minutes per side for medium rare. Let the steaks rest for at least 5 minutes. 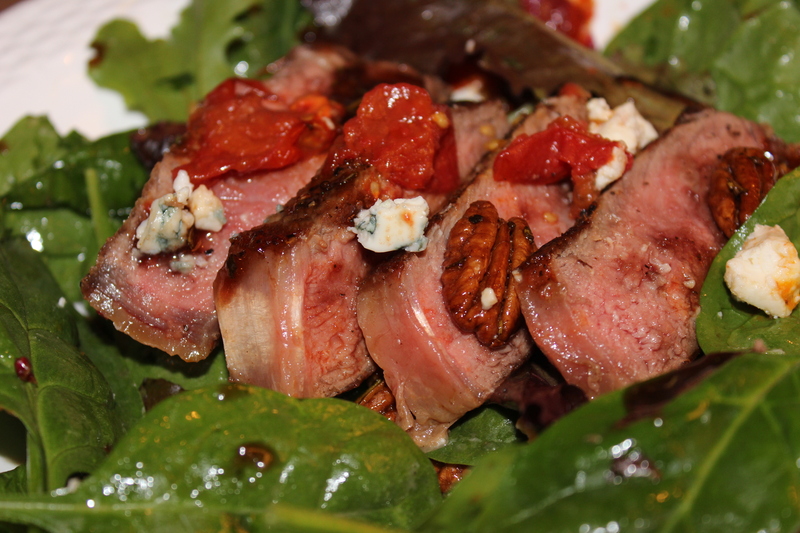 Top the greens with the sliced steak, tomatoes, crumbled blue cheese and walnuts, drizzle the ruby pot syrup over top and serve. This entry was posted in Recipes and tagged beef, Ruby Port, salad, Steak, Stilton cheese, Walnuts. Bookmark the permalink.